Till 1964, the town was quite backward and students of this area had to go to distant places for achieving higher studies or were compelled to give up their desire for it. Though the lack of facilities for achieving higher education were felt, nobody came forward to fill the gap perhaps due to lack of motivation, inspiration and determination. However, Late Seth Shri Bhawgandasji Todi took the problem deeply for the first time and decided to establish an Institution for providing higher education. 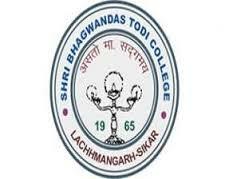 Shri Bhagwandas Todi College, Sikar offers various graduate courses as well as Post Graduate courses. Shri Bhagwandas Todi College, Sikar is affiliated to University of Rajasthan, Jaipur. List of facilities available at Shri Bhagwandas Todi College, Sikar for students. This page was last modified on 14 July 2015 at 18:07.